After playing a mad and obsessed Mogul King in Padmaavat, Actor #Ranveer_Singh is all set to don “rapper” avatar in his forthcoming musical drama film #Gully_Boy. And the latest updated video from the actor proves he is getting into the skin of his character quite seriously. Ranveer Singh keeps his fans updated via social media post and his latest video on his Instagram story where he is seen rapping on the new video song, titled 'Paisa Nahi Rap Mera Shauk Hai', by rapper Divine. 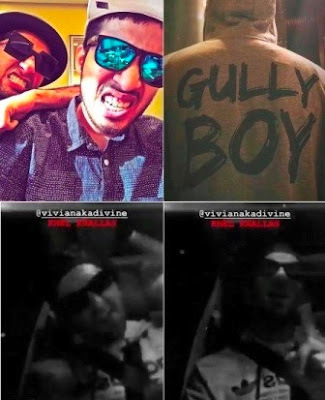 Gully Boy is a musical drama film directed by Zoya Akhtar. It stars Ranveer Singh and Alia Bhatt in lead roles. It is being co-produced by Akhtar's Tiger Baby and Excel Entertainment productions. The film is based on the lives of Vivian Fernandes aka Divine and Naezy known for their song "Mere Gully Mein" in Mumbai. It is confirmed for release on 14 February 2019. After wrapping Gully Boy, Actor Ranveer Singh will kick-start Simmba, which will be his first movie with Rohit Shetty and the filmmaker’s maiden venture with Karan Johar’s Dharma Productions’ banner. The film also stars Sara Ali Khan in the lead and may have Ajay Devgn on board for a cameo role. The film which will hit theatres on December 28 this year will also have Sonu Sood on board as the main antagonist.